The East Riding of Yorkshire, or simply East Yorkshire, is a local government district with unitary authority status, and a ceremonial county of England. For ceremonial purposes the county also includes the city of Kingston upon Hull, which is a separate unitary authority. 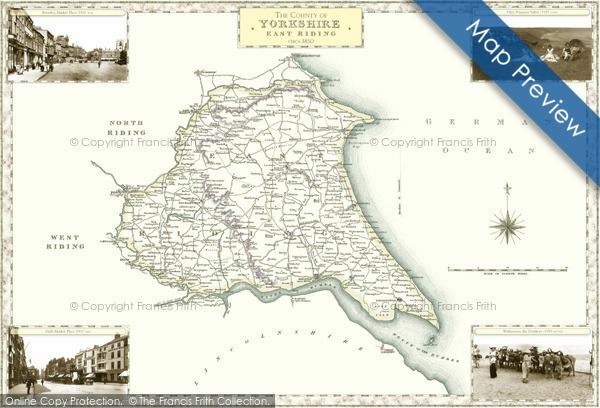 It is named after the historic East Riding of Yorkshire (one of three ridings alongside the North Riding and West Riding), which also constituted a ceremonial and administrative county until 1974. From 1974 to 1996 the area of the modern East Riding of Yorkshire constituted the northern part of the non-metropolitan county of Humberside. The landscape consists of a crescent of low chalk hills, the Yorkshire Wolds, surrounded by the low lying fertile plains of Holderness and the Vale of York. The Humber Estuary and North Sea mark its southern and eastern limits. Archaeological investigations have revealed artefacts and structures from all historical periods since the last ice age. There are few large settlements and no industrial centres. The area is administered from the ancient market and ecclesiastical town of Beverley. Christianity is the religion with the largest following in the area and there is a higher than average percentage of retired people living there. The economy is mainly based on agriculture and this, along with tourism, has contributed to the rural and seaside character of the Riding. These aspects are also reflected in the places of interest to visitors and major landmarks, which include historic buildings, nature reserves and the Wolds Way long-distance footpath. The open and maritime aspects and lack of major urban developments have also led to the county being allocated relatively high targets for the generation of energy from renewable sources. Major sporting and entertainment venues are concentrated in Kingston upon Hull, while the seaside and market towns support semi-professional and amateur sports clubs and provide seasonal entertainment for visitors. Bishop Burton is the site of an agricultural college, and Hull provides the regions only university. On the southern border, close to Hull, the Humber Bridge spans the Humber Estuary to enable the A15 to link Hessle with Barton-upon-Humber in North Lincolnshire. When the last glacial period ended, the hunter gatherers of the Palaeolithic period followed the animal herds across the land between continental Europe and Britain. Then, as conditions continued to improve and vegetation became more able to support a greater diversity of animals, the annual range of seasonal movement by Mesolithic communities decreased, and people became more fixed to particular localities. Until about 6,000 BC, Mesolithic people appear to have exploited their environment as they found it. As communities came to rely on a smaller territorial range and as population levels increased, attempts began to be made to modify or control the natural world. In the Great Wold Valley pollen samples of Mesolithic date, indicate that the forest cover in the area was being disturbed and altered by man, and that open grasslands were being created. The Yorkshire Wolds became a major focus for human settlement during the Neolithic period as they had a wide range of natural resources. The oldest monuments found on the Wolds are the Neolithic long barrows and round barrows. Two earthen long barrows in the region are found at Fordon, on Willerby Wold, and at Kilham, both of which have radiocarbon dates of around 3700 BC. From around 2000 to 800 BC the people of the Bronze Age built the 1,400 Bronze Age round barrows that are known to exist on the Yorkshire Wolds. These are found both in isolation and grouped together to form cemeteries. Many of these sites can still be seen as prominent features in the present-day landscape. By the later Bronze Age, an open, cleared, landscape predominated on the Wolds. It was used for grazing and also for arable cultivation. The wetlands on either side of the Wolds in the River Hull valley, Holderness and the Vale of York were also being used for animal rearing at this time. In the Iron Age there were further cultural changes in the area. There emerged a distinctive local tradition known as the Arras Culture, named after a site at Arras, near Market Weighton. There are similarities between the chariot burials of the Arras Culture and groups of La Tene burials in northern Europe, where the burial of carts was also practised. The area became the kingdom of the tribe known as the Parisii. After invading Britain in 43 AD the Romans crossed the Humber Estuary in 71 AD to invade the Northumbrian territory of the Parisii tribe. From their bridgehead at Petuaria they travelled northwards and built roads along the Wolds to Derventio, present day Malton, and then westwards to the River Ouse where they built the fort of Eboracum. There is evidence of extensive use of the light soils of the Wolds for grain farming in the Roman era. Several Roman villas which were the centres of large agricultural estates have been identified around Langton and Rudston. In the low-lying lands on either side of the Wolds there was an increase in the number of settlements between 500 BC and 500 AD as the land became drier and more accessible due to a fall in sea level. The lower-lying land was used for stock breeding. During the last years of Roman occupation Anglo-Saxon raiders were troubling the area and, by the second half of the fifth century, settlement by Anglian invaders was taking place in east Yorkshire. Village names containing the elements -ing, -ingham or -ham are Anglian settlement names. As Christianity became established in the area from the seventh century onwards, several cemeteries like the one at Garton on the Wolds show evidence of the abandonment of pagan burial practices. In 867 AD the Great Danish Army captured the Anglian town of York, and the remnants of the army settled in Yorkshire from 876 AD when their leader Halfdan shared out the land among them. Scandinavian settlements have names including the elements -by and -thorpe. Scandinavian rule in the area came to an end in 954 AD with the death of their ruler Eric Bloodaxe. After the Norman Conquest of England by William the Conqueror in 1066 AD, the land in the East Riding was granted to followers of the new Norman king and ecclesiastical institutions. When some of the northern earls rebelled, William retaliated with the Harrying of the North which laid waste many East Riding villages. The land was then distributed among powerful barons, such as the Count of Aumale in Holderness and the Percy family in the Wolds and the Vale of York. These lay lords and ecclesiastical institutions, including the monasteries, continued to improve and drain their holdings throughout the Middle Ages to maximise the rents they could charge for them. In the mid-sixteenth century Henry VIII of England dissolved the monasteries, resulting in the large areas of land owned by Meaux Abbey, Bridlington Priory and other monastic holdings being confiscated. The Crown subsequently sold these large tracts of land into private ownership. Along with the land already belonging to lay owners, they formed some of the vast estate holdings which continued to exist in the Riding until the twentieth century. The eighteenth and nineteenth centuries saw first the expansion of canals and then the construction of rail links. The River Derwent was canalised as far upstream as Malton and was linked to Pocklington by the cutting of the Pocklington Canal. Other canals were cut to join the towns of Beverley and Driffield to the River Hull, which was also improved to aid navigation. The Market Weighton Canal connected the town directly to the Humber Estuary. An early rail link was constructed between Filey and Bridlington in 1847 and the Malton to Driffield railway was the first to cross the Wolds in 1853. These routes primarily served the agricultural community in helping to get their products to the expanding industrial markets in the West Riding of Yorkshire and to the port of Hull for export. The rail links served also to transport holidaymakers to the expanding coastal resorts of Bridlington, Hornsea and Withernsea. The canals and canalisation of some of the rivers helped to aid drainage in such of the low-lying ill-drained areas that then still existed. The landscape in the East Riding had changed little since the enclosure of the open fields, in the eighteenth and nineteenth centuries, except for the removal of some hedgerows to allow for the use of large agricultural machinery in the twentieth century. 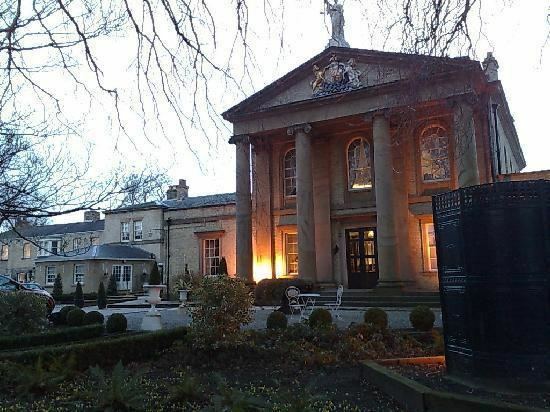 As a ceremonial county, the East Riding of Yorkshire borders North Yorkshire, South Yorkshire and Lincolnshire, and includes the city of Kingston upon Hull, which is a separate unitary authority. 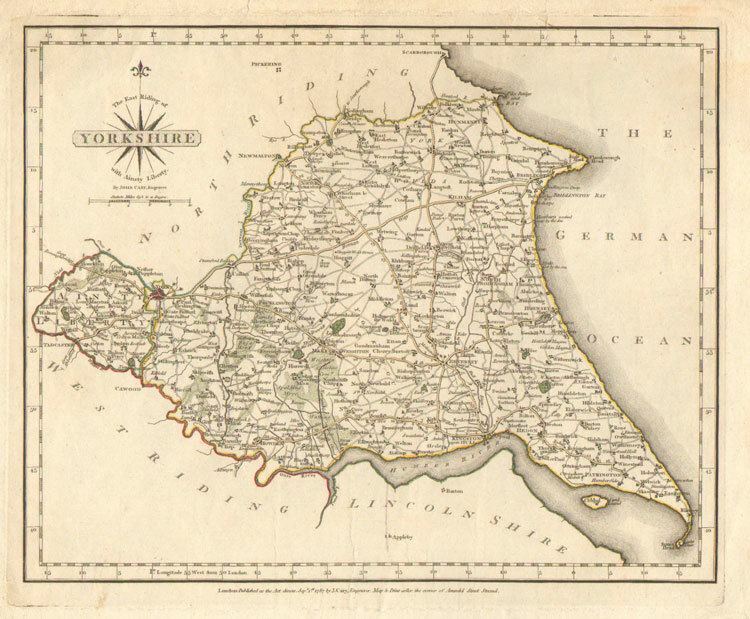 As a district the East Riding borders North East Lincolnshire, beyond the Humber estuary; North Lincolnshire, beyond the Humber and on land; Hull, Doncaster, Selby, York, Ryedale and Scarborough. The district is generally rural, with no towns approaching the size of Hull. There are a few market towns such as Beverley, Driffield, Goole, Market Weighton and Pocklington, and the coastal towns of Bridlington, Hornsea and Withernsea. In the south the district contains areas such as Hessle which are part of the Hull urban area but outside the city boundaries. Rural areas tend to have a greater business stock than urban areas, reflecting the number of agricultural businesses and small businesses in rural areas. 20% of all VAT registered businesses in the East Riding are in agriculture and related sectors, although the number of such businesses fell by 40% between 1997 and 2003. Easington, on the coast, is the site of a natural gas terminal, Easington Gas Terminal, used for the Langeled pipeline, as well as three other gas terminals operated by BP and Centrica. The traditional cuisine of Yorkshire, in common with the North of England in general, is known for using rich tasting ingredients, especially with regard to sweet dishes, which were affordable for the majority of people. There are several dishes which originated in Yorkshire or are heavily associated with it. Yorkshire pudding, a savoury batter dish, is by far the best known of Yorkshire foods, and is eaten throughout England. It is commonly served with roast beef and vegetables to form part of the Sunday roast but is traditionally served as a starter dish filled with onion gravy within Yorkshire. Yorkshire pudding is the base for Toad in the Hole, a dish containing sausage. Other foods associated with the county include: Yorkshire curd tart, a curd tart recipe with rosewater; Parkin, a sweet ginger cake which is different from standard ginger cakes in that it includes oatmeal and treacle; and Wensleydale cheese, a cheese made with milk from Wensleydale and often eaten as an accompaniment to sweet foods. The beverage ginger beer, flavoured with ginger, came from Yorkshire and has existed since the mid 18th century. Liquorice sweet was first created by George Dunhill from Pontefract, who in the 1760s thought to mix the liquorice plant with sugar. Yorkshire and in particular the city of York played a prominent role in the confectionery industry, with chocolate factories owned by companies such as Rowntrees, Terrys and Thorntons inventing many of Britains most popular sweets. Another traditional Yorkshire food is pikelets which are similar to crumpets but much thinner. The Rhubarb Triangle is a location within Yorkshire which supplies most of the rhubarb to locals. In recent years curries have become popular in the county largely due to the immigration and successful integration of Asian families. There are many famous curry empires with their origins in Yorkshire including the 850-seater Aakash restaurant in Cleckheaton which has been described as "the worlds largest curry house".